Han Bat flies so far under the radar it could give pointers to a Stealth Fighter. Tucked between the now shuttered Penguin and a seemingly closed Korean bar in a down at the heels Lawrence Ave strip mall a casual sight/alight is out of the question. Add to the fact the main, and pretty much only, offering is Sul Lung Tang, a milky white ox bone soup, not exactly blueberry pancakes at IHop. Reminded of sul lun tang by this reference on LTH and Mike Sula's Reader Han Bat review, it was time for a fortifying bowl of long simmered marrow enriched ox bone soup. Tendon was tempting, though tongue won the toss. Only accents available to enliven the neutral, ok, bland, soup are chopped scallion, sea salt and chili paste. Whole cabbage kimchi is cut at the table and has a lovely fermented funk which plays nicely with the marrow rich broth. Daikon radish kimchi, rice and roasted corn tea round out the meal. 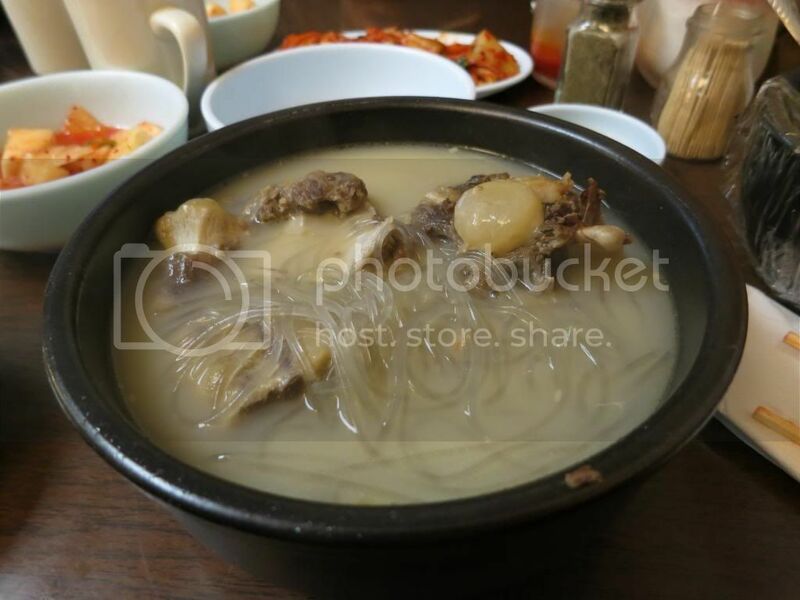 Prices are reasonable, all soups, with the exception of tendon, are $6.89 and include rice, tea and kimchi. Physical space is comfortable, though on the minimalist side, and Han Bat has it's own, mostly empty, parking lot as the other businesses have closed. For the folks who aren't familiar with So Lung Tang, the soup comes unsalted when served, you do your own salting (seasalt at table) and pepper, hot sauce (my own favorite additional condiments) to your liking. They also serve you a bowl of rice, you can either use your soup spoon to scoop up some rice then dipped into the soup and eat, or as some of us (me ) like, dump half a bowl of rice at a time into the soup and eat it with everything else in the soup (noodle, meats, etc). Hang Bat was half full when we went this Saturday for a nice hangover fixing (as it is popularly referred to in Korea as well). We got the combo (tendon, tongue and something else I can't remember) plate ($15) on top of a bowl of So Lung Tang for each of us. Perfect portions for lunch. With that said, at the end of the day So Lun Tang is a mild tasting beef soup whose beauty is in its subtleties—so don't go expecting huge flavors or to be wowed by flavor combinations. Knowing that I've become mildly obsessed with Korean food recently, a coworker invited me to join him and his Korean wife at Han Bat for sullungtang a week or so ago. The broth itself had a great mouth feel to it, and I liked the modify it as you go approach with the sea salt, chili paste and scallions (reminded me of modifying Pho as you eat it). Tongue slices were silky tender, and added to the pleasingly-soft feel of the soup. As mentioned upthread, this is definitely not a bold soup. When I think of Korean soups, I generally think kimchi stew, which is what I've personally had the most of. Or now, sundae-guk, which I just tried last weekend. Sullungtang is subtle, with incredible texture, and a welcome addition to my growing rotation of Korean soups. Everything else at Han Bat - the rice, cabbage kimchi, daikon kimchi, and roasted barley tea - was quite good, and rounded out a great Winter meal. Thanks for bumping this. 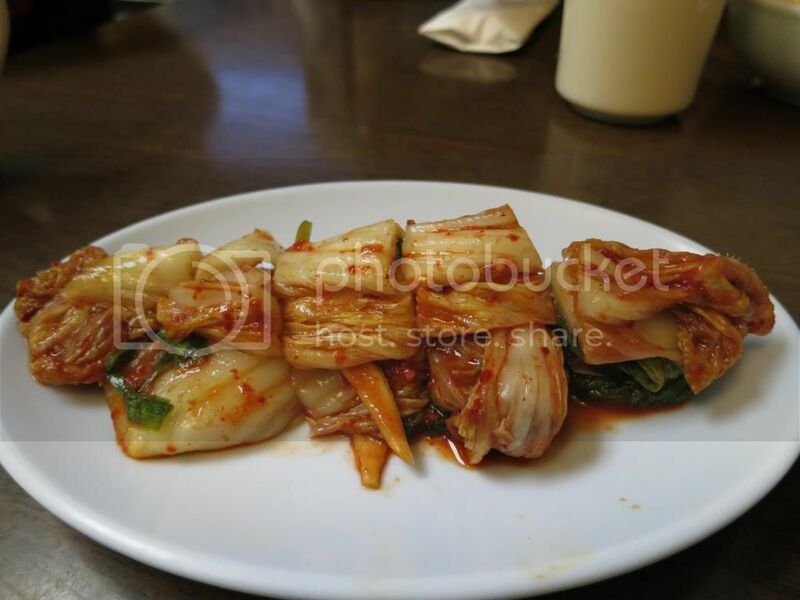 I've been looking for a local source for sullungtang for a while. Looks like a trip to Han Bat is in my near future. cilantro wrote: Thanks for bumping this. I've been looking for a local source for sullungtang for a while. Looks like a trip to Han Bat is in my near future. Han Bat is one of the best examples of the "Do one thing and do it well" philosophy you're likely to find. It's still perfect sullungtang weather for a while -- everyone should go here and post about it so we can nominate it for a GNR in 5-10 years. Had an awesome bowl of So Lun Tang recently, so I figured I'd give Han Bat a bump. They start you off with some pickled radish and some excellent kim chi. We ate up almost all of the starters before we realized we're supposed to use them in the soup. Both are very nice renditions, balancing spicy and sweet while maintaining a nice vegetable crunchiness. The star, of course, is the So Lun Tang soup. Similar to pho at Vietnamese joints, they offer the same broth with any combination of meats you'd like. I ordered the ox tail special which came with 3 generously meaty pieces of ox tail. The soup only needs a little kick from the spicy sauce and a shake of sea salt, since the texture really is the star of the show. The soup is smooth and hearty, rib sticking and satisfying in a way that reminds you that cooler weather has its perks. The oxtails were tender and intensely beefy. This is a great dish and I look forward to getting another bowl soon. Just wanted to remind people that it's out there. One of Chicago's true gems. In my mind, the quintessential not-yet-named GNR. I go here often, and feel fortunate every time I do that we have this place in Chicago. It is one of those places which I appreciate yet almost take for granted due to its simplicity. I'm actually shocked to find out this is not yet a GNR, as it definitely is in my mind. Stopped by for a quick bite, and was met with closed off parking lot, closed restaurant, and a sign on the door. Loosely translated from Korean co-worker. wrote: Closing June 15 for family reasons. Re-opening about 5 months. I saw this mention on Serious Eats and it got me wondering when they're opening again. Anyone have any intel? I don't know about Han Bat but I was with Laikom having some very respectable Soon Du Bou at a place on Bryn Mawr that he claims to be preparing a post on ( ) and we saw a place--name is escaping me but Laikom has a pic of the sign--a block or so down the street that advertised the bone soup. Hoping to check it out soon! Correct you are boudro. I posted on the appropriate thread HERE. Turkob, the Han Bat parking lot is still closed off, and the same sign is still posted on the door. As noted up thread, other than Han Bat, the rest of the building (a former Texaco station for those interested in such trivia) has been vacant for years and was in a state of significant disrepair. Roof repairs were made during the summer, but I have not seen any signs of activity since then. Hopefully Han Bat is not following in the footsteps of the Penguin or Korean Restaurant, but that stretch of Lawrence Avenue has history as the Location of the Damned. Turkob, yesterday a workman said the building is going to be demolished, which does not bode well for a return of Han Bat at that location. Han Bat has re-opened! Rejoice! laikom wrote: Han Bat has re-opened! Rejoice! And if living another day wasn't enough, Han Bat reopens! Joy, Joy, Joy! Seth commands our full attention as he interprets the menu; beef bone soup, beef bone soup, or beef bone soup. The new Han Bat is same as the old Han Bat. Firing on all cylinders, if not better than before. Some of the best, if not the best, house made kimchi (radish and cabbage) in the city. I love a restaurant that leads the dinner conversation to how excited we all are for our next hangover. Just don't try to go for lunch. They're turning away customers and telling them to come back after 6pm. Can't keep up with demand. I love when I try a dish for the first time and am pretty sure I just had the ideal version of it. Ordered tonight with brisket and tongue (perhaps I should cross-reference on the Passover thread? ). Thank you for this gem just a couple of blocks from home. Just a bump to remind everyone this place still exists and is fantastic. A great neighborhood restaurant, you could say. If there is better kkakdugi in Chicago, I’d like to know where it is. cilantro wrote: Just a bump to remind everyone this place still exists and is fantastic. A great neighborhood restaurant, you could say. If there is better kkakdugi in Chicago, I’d like to know where it is. I'll go on record and say the suhlungtang here is the best Korean soup served in the Chicagoland area. And I don't think it's even close. It's perfect. Though I can't remember the last time I had a hangover I'm a semi-regular at Han Bat. Subtle, verging on delicate, no punch in the face flavor but after a few sips an involuntary sigh and smile occur. Tongue and tendon lurking just below the surface. Han Bat, Count me a Fan! They're two very different soups, but I'd put Dancen's spicy cod roe soup (al-tang with fish intestines) alongside Han Bat's seolleongtang as my favorite Korean soup in Chicago. Not gonna argue with that! Big fan of al jiggae. I just love how much more rich the broth is at Han Bat vs the many other mediocre bowls I've had around here.